Is your conveyor up to the task of today’s material handling? The wood industry has seen major improvements in terms of processing and production machinery, but material handling equipment has largely lagged. The technology of 20 and 30 years ago simply isn’t up to the expectations of today’s industries. Paddle fingers. Things are always getting into conveyors which shouldn’t. When a wedge-shaped contaminant gets under the paddle in a traditional drag conveyor, it lifts the paddle off the floor. When that upward movement reaches the limit of upper travel, the paddle and frame twist. This twists the tab and the chain link, and now you have high friction at the floor and at the contact point of the chain in the wear strips. Our fingers don’t allow small wedges to even get started because there is no straight surface along the floor. When a large piece tries to bridge several fingers, the fingers flex and absorb the force. This flex is enough to prevent the transfer of high forces to twisting of the paddle assembly. When we figured this out, we saw amp loads decrease in our conveyors immediately. Paddles don’t touch the floor. In a typical drag conveyor, the paddles run on the floor, increasing friction and wearing out paddles and floors. Our paddles are supported by the chains in the wear strips. A buildup of material in front of the paddle wipes the floor clean. Dual chains outside the material path. Dual chains means the paddles frames can be lighter because they are connected at both ends. Dual chains reduces the load on each chain for longer life. Staying out of the material reduces chain wear, improves flow, and increases capacity. Supported chains. The chains are fully supported the full length of the conveyor in easily replaceable wear strips. Every wear strip in a straight section is identical and can be replaced with the chain in place. You just work between the paddles. You will stock ONE part number for wear strips. Easy-to-replace wear strips. ONLY our conveyors allow the curve wear strips to be replaced from OUTSIDE the conveyor. IN MINUTES! Here’s the video https://vimeo.com/154898954. Identical panels. Top and bottom panels are identical for low spare parts requirements. Strong components. 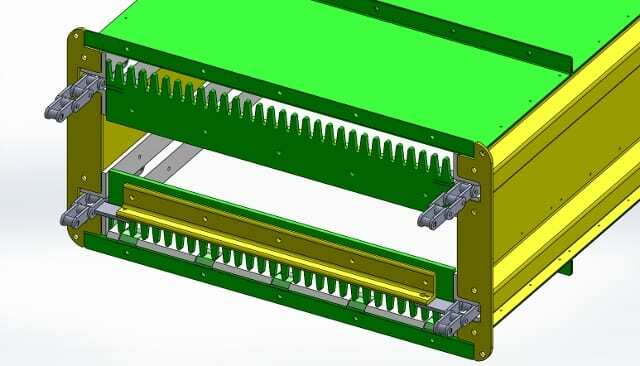 All components in our S-series conveyors are 10 gauge, and the side panels have 10 bends. The assembled system is very strong, which allows for longer spans between supports. Gearmotor design. We use only shaft-mounted, inverter-duty gearmotors to drive the conveyors. There are no guards, belts, or pulleys to maintain. We connect the gearmotor with a powerlock, so there are no keys to weaken the shaft. Variety of options. Common options include: gates (hydraulic, electric, or pneumatic. They fit in place of a standard panel, so they can even be added later. ); floor liners of UHMW or AR plate; zero-speed switches; high-temperature wear materials (hot pellets); stainless steel; and chutes for inlets and outlets. Contact Biomass Engineering & Equipment for assistance with your next conveyor project.